Frozen Broadway actor Timothy R. Hughes, who plays the Troll King in the musical, ripped a Donald Trump 2020 presidential flag from the hands of an audience member in the front row, who was waving it to the audience. The show is based off of the hit film with music and lyrics by Kristen Anderson-Lopez and Robert Lopez from the book written by Jennifer Lee. The show made its Broadway debut in March of this year and has been a big success. Getting Frozen tickets can be difficult, especially a front row seat. With that being said, a man with a Make America Great Again visor sat in the front row, and then took out his Donald Trump 2020 campaign flag and began to wave it back at the packed house during the curtain call while the cast was receiving a standing ovation. Frozen cast member Timothy Hughes quickly grabbed the Trump flag and threw it backstage, gaining cheers from the crowd. Video of the incident reveals that the man started to shake his fists after Timothy R. Hughes ripped his Trump flag from his hands. The unidentified Trump supporter was later seen outside of the Frozen show, threatening to sue if he did not get his flag back. It is unclear at this time if he ever had his property returned. Hughes released a lengthy statement on social media in regard to the incident and remains unapologetic. He had this to say. "What does it say about our country and politics when a man at the show tonight felt the need to protest Disney's Frozen on Broadway with a pro Trump flag? How frightening is it that our show's messages of love, acceptance, and diversity have become the opposition to supporting Trump? The curtain call is a thank you between actors and audience, a final connection to end a shared experience. I will not apologize for how I responded to the disrespectful man trying to interrupt this moment with a pathetic political platform. Not at our show! Not in front of my beautiful, diverse, talented cast at Frozen Broadway. I appreciate everyone's support." This isn't the first time that Broadway has gotten political since President Donald Trump won the 2016 election. A few days after winning the election, Vice President-elect Mike Pence attended a showing of the smash hit Hamilton, which elicited boos from the audience. As Pence started to leave during the curtain call, the cast chose to deliver a speech to the vice president, hoping that the show inspired him to represent all of American values and to speak out for diversity. Trump then asked his followers to boycott Hamilton. With the primary election coming up soon and the current confirmation hearings of Brett Kavanaugh, opposing views are attacking each other left and right. 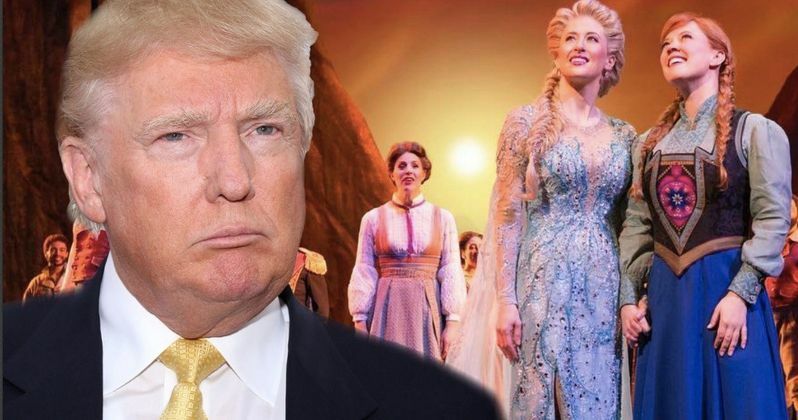 Taking a Donald Trump campaign banner to a Frozen Broadway show wasn't the greatest idea and it shows just how divided the country has become. In the end, the cast has now brought even more attention to the incident. You can watch video of the unidentified man waving his Trump banner below, provided by Timothy R. Hughes' Instagram account.